Way, way up in northwestern Canada (on the lower east side of Cape Bathurst, Northwest Territories), where the mainland meets the Arctic Ocean, a 30 km stretch of seacoast has been smoldering away for hundreds if not thousands of years. 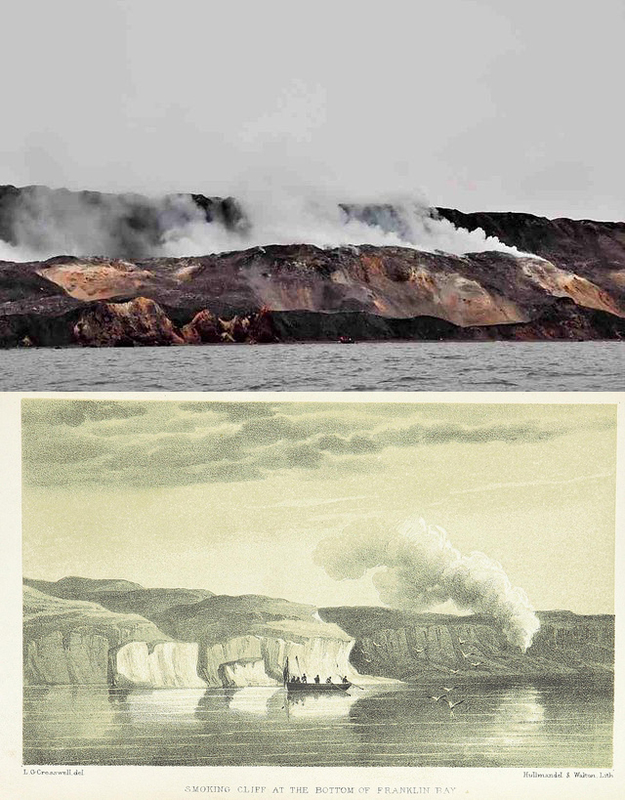 The Smoking Hills, named by the explorer John Franklin during one of his early 19th century expeditions to the Canadian Arctic, consist of shale bedrock covered by several meters worth of soil and loose rocks deposited by ancient glaciers and rivers. The land falls away at the coast (we're talking a 100 m high escarpment carved out by waves), exposing the otherwise buried shale to the atmosphere. Now, this shale is notable for containing bitumen (an extremely gooey form of crude oil) as well as very fine grains of sulfide minerals such as pyrite. Both contain lots of electrons and are thus susceptible to reacting with electron-craving substances such as oxygen gas. This doesn't tend to happen while they are buried in the ground, but at the cliffs they encounter our oxygen-filled atmosphere. Uncovered by erosion of the cliff, sulfide in the shale gives up its electrons to oxygen and is converted to sulfate. This reaction generates heat, which can build up to the point at which bitumen in the shale will catch fire (in other words, start reacting violently with oxygen). It then burns into the cliff until the oxygen supply drops too low and the fire is extinguished. The Smoking Hills area is tundra with a smattering of small (<1 ha) shallow (<1 m) ponds. Given their polar locale, the ponds are free of ice only a couple of months of the year. The soil in the area is calcareous, a fancy way of saying it's mostly calcium carbonate (marl, to be exact). Consequently, the ponds and surrounding soils tend to be alkaline (pH 8-10), contain lots of calcium, and are well-buffered (they can absorb the addition of a lot of acid before their pH drops by a lot). However, the soils and ponds closest to the burning cliffs are acidic (pH ~2-4). They've been impacted by the large amounts of sulfur dioxide (which reacts with water to form sulfuric acid) released from the sulfur-rich shale as it burns. As a whole, the Smoking Hills pump out roughly 300 grams of sulfur dioxide every second. When the wind is right, visible plumes made up of sulfur dioxide, sulfuric acid mist, and smoke are carried dozens of kilometers inland from the cliffs, sowing the tundra with acid (any rain falling directly through the plume ends up with a pH as low as 2). Ponds near the Smoking Hills also have high concentrations of metals, which accumulate there after being leached from surrounding acidified soils or deposited via smoke from the burning shale. Their solubility increases as pH decreases, so although the acidic ponds appear clear and clean they actually are chock-full of dissolved metals. In this form, metals are easy to absorb and so are at their most toxic. The hidden metals are revealed when the pH of water collected from the ponds is raised to ~4, at which point the water turns cloudy and red-orange-brown as iron and aluminum (along with other less abundant metals) precipitate out of solution. One paper I came across reported finding 90 species of algae in unimpacted ponds, but only 14 in acidic ponds. The average density of phytoplankton (any microscopic organism making its living via photosynthesis) in highly acidic ponds was observed by researchers to be only 1% of the density in unimpacted ponds. The acidic ponds have been reported to be devoid of larger crustaceans and any vascular aquatic plants. 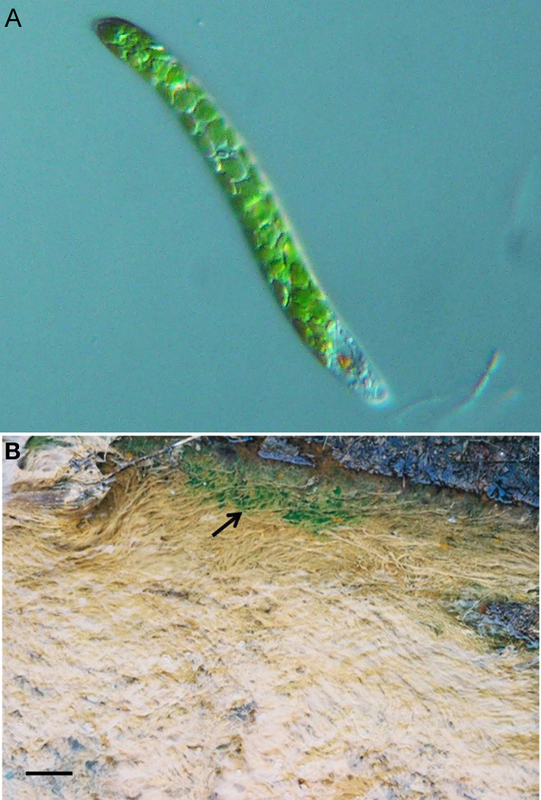 Interestingly, the algal residents of acidic ponds tend to also be found in acidic environments across the globe, while neighbouring unimpacted ponds are inhabited by algae typical to the Arctic. The low pH seems to have been too much for local algae to handle, so instead acid-tolerant species have somehow made their way there from afar (perhaps via migrating birds). 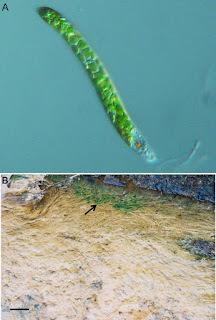 Algae flourishing in the acidic ponds include Chlamydomonas acidophila (also found in a highly acidic volcanic lake in Japan and acidic streams in Britain) and Euglena mutabilis (occurs worldwide in acid mine drainage and volcanic lakes). They tend to grow at the bottom of the ponds, which may be due to the pH being slightly higher near the sediment surface. E. mutabilis is also noteworthy for being best friends with a yeast. Wherever this alga is found, so too is the yeast. It reminds me of a lichen, which is a fungus interwoven with an alga and/or cyanobacterium, although in this case the two buds are submerged in water and have a far looser association. The yeast appears to provide a local source of carbon dioxide to fuel photosynthesis by the alga, and receives a supply of food for its troubles. In the lab, the two grow better together than apart when the pH is low and the metal concentrations are high. This cooperative lifestyle appears to be key to their survival in highly acidic environments. 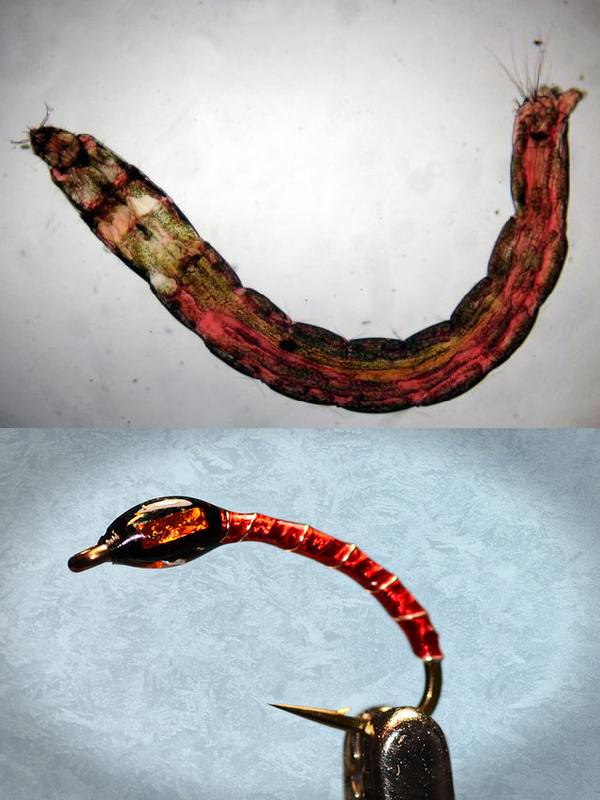 Another organism found in acidic ponds near the Smoking Hills is Chironomus riparius, a non-biting (woo!) midge somewhat reminiscent of a mosquito (here's a swarm of them). Its larvae are known as blood worms due to their vibrant red colour, the result of having lots of hemoglobin in their hemolymph. This enables them to store up oxygen and live underwater in places where there isn't much of the gas to be had. Large numbers of C. riparius have been observed at the bottom of acidic ponds, suggesting they're very good at dealing with acidity and metals. A study comparing C. riparius larvae from acidic ponds near the Smoking Hills with larvae found in Sweden concluded the former tended to tolerate acidic water better than their Swedish relatives. The Canadians contained twice as much hemoglobin as the Swedes and their hemolymph had a relatively high buffering capacity. These features likely are adaptations to acidic pond life. Plants growing in soils close to the Smoking Hills have to deal with not only highly acidic soil filled with toxic metals, but also direct exposure to harmful sulfur dioxide and acid rain. Nearest to the burning cliffs, the land is barren. The first plants, covering <5% of the land, appear 150-200 m from the cliff edge. They are Artemisia tilesii (stinkweed, a perennial herb) and Arctagrostis latifolia (wideleaf polargrass). These are typical members of Arctic tundra communities, but they happen to be relatively well equipped to deal with pollution. In particular, A. tilesii leaves are good at neutralizing droplets of acid rain shortly after they land on them. This process is enhanced in A. tilesii compared to spinach and wax beans, and appears to involve the plants getting lots of Ca, Mg, and K to the surface of their leaves to assist with the neutralization. Further away (~250 m) from the cliffs, additional plants make an appearance but contribute little to the amount of ground covered by vegetation relative to coverage by A. tilesil and A. latifolia. Among these are Salix arctica, a short shrub otherwise responsible for much of the vegetation cover in areas not appreciably impacted by the Smoking Hills. This spatial arrangement of increasing plant cover and diversity with distance is similar to what you see around a human-created concentrated source of air pollution (e.g. a smelter). Jernelöv A, Nagell B, Svenson A. 1981. Adaptation to an acid environment in Chironomus riparius (Diptera, Chironomidae) from Smoking Hills, NWT, Canada. Ecography 4(2):116-119.